If Santa didn’t deliver you one pair of matching bookends, different as night and day, MeTV is here to help. Starting Monday, January 4, 2016, The Patty Duke Show will rerun on MeTV, weekdays at 6:00am ET/PT. 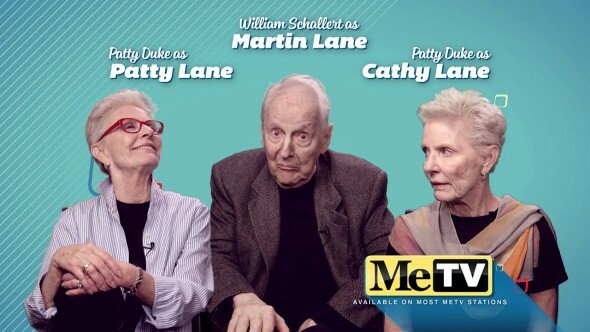 In advance of the identical cousins’ sitcom MeTV debut, the cable outlet has released a Patty Duke Show reunion promo, starring Patty Duke as Patty Lane, William Schallert as Martin Lane, and Patty Duke again, as Cathy Lane. Watch it, below. The Patty Duke Show ran on ABC from 1963 to 1966, for 104 episodes, over the course of three seasons. ABC canceled The Patty Duke Show, because it would have cost too much to shoot in color. The cast reunited for The Patty Duke Show: Still Rockin’ In Brooklyn Heights TV movie, which aired on CBS in 1999, and provided some long-awaited closure for fans. More recently, Duke and Schallert reunited with Paul O’Keefe (as Ross Lane) and Eddie Applegate (as Richard Harrison) in a series of public service announcements for the Social Security Administration. Will you tune in for MeTV’s reruns of The Patty Duke Show? Have you watched the series either in first run, or other syndicated runs? How long will the theme song be stuck in your head? Tell us. More about: ABC TV shows: canceled or renewed?, CBS TV shows: canceled or renewed?, MeTV TV Shows: canceled or renewed?, The Patty Duke Show, The Patty Duke Show: canceled or renewed? I was born almost to the day that The Patty Duke show debuted. I am fascinated with this show. I love the everything from the clothes to the way teens talked back then. This is the first I have watched this series. I recorded it every morning and watch it later in the day. Would loved to seen it in color. great how I watch it everyday before work also watched the show when I was in my early teens and younger. It stuck in my head to the point where I can play the tune on my bagpipes.